There are many different workout routines you can do, and as long as they are set up correctly and followed, they will work. But, out of those workouts, a few stand out as being better, more popular, and proven to work more than others. The total body workout is definitely one of those workouts! 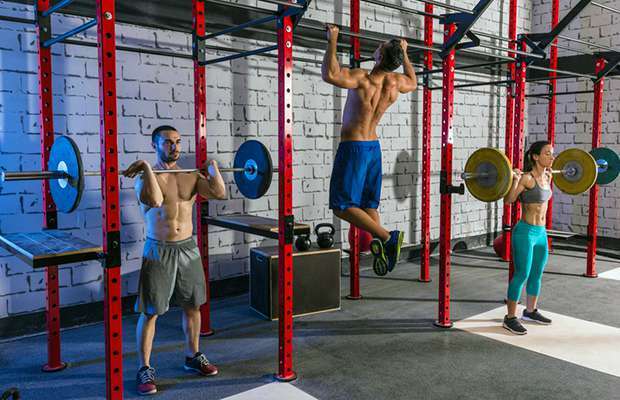 Aside from the total body workout being one of the most tried and true workout routines in existence, there’s a few other reasons that people are drawn to it. For beginners, full body training is the most effective way to train. If you can only find time to workout 3 days per week, then 3 full body workouts is one of the most often effective way to do it. It’s high frequency so the routine has you hitting each body part up to 3 times per week. This method of training works. Assuming you set it up and plan it out properly of course. So, let’s start building your workout. With most other workouts, you are breaking things up in terms of body parts. Maybe a 3 day split of chest, shoulders and triceps one day, legs another, and back and biceps on the third. Maybe a 4 day split of chest and triceps one day, back and biceps another, legs a different day, and shoulders on the last. Or even a 2 day upper and lower split where you hit your upper body one day, and your lower body the next. Whatever it is, your workouts are split up in terms of body parts and muscle groups. With full body training however, you’re hitting everything all at once, all in the same workout. This is the most common split for full body training. The days of the week you choose to train are up to you as long as you keep the basic structure the same. This split will allow for enough rest and recovery for consistent progress to be made. This is the most effective way to train when you can only manage to fit in 2 workouts per week. The workout should hit most of your body either directly or indirectly. You must make that first guideline happen with not many total sets per muscle group. The reason for this is for recovery. A total body workout routine has you hitting just about everything in every workout, and because you are typically doing this workout 3 times per week with only 1 day (sometimes 2) off in between, you need to keep the volume low to compensate and still allow for adequate recovery. More often than not, the bulk of your volume per workout should be dedicated to the more important compound exercises (bench press, rows, squats, etc. ), with only a small amount of work being done for the isolation exercises. This ABA, BAB format is a popular way of doing it, so that’s how I’ll be doing it throughout the rest of this article. A push exercise (a chest or shoulder exercise). A pull exercise (a back exercise like a row or a pull-up/lat pull down). A leg exercise (like a squat or deadlift). If you happen to be a beginner, this is the ideal programme for you. If you’re wondering where the arm exercises are, you will notice that all push exercises (bench press, shoulder press, etc.) hit your triceps, and all pull exercises (rows and pull-ups/pull-downs) hit your biceps. This is a basic and effective total body workout routine for those of you who will be doing 3 workouts per week. This would only be for if you could only train twice per week (these would be the only 2 workouts you’d do all week), and you’d have to keep the sets per exercise low to keep each workout to a beneficial length.